On Thursday, May 21, I attended the first ever Smart Tech Gun Fair in the Nation, hosted by the New Rochelle, NY Police department. What is a “smart gun?” It’s a gun that can only be used by the authorized user (think about a “smart phone”) and there are a variety of ways to do this. The goal of this event was to initiate discussions between smart-gun developers, law enforcement leaders and public officials. Five developers were present with one bringing a market ready smart rifle whose technology could be applied to a handgun. One rifle requires the user to wear a special ring that activates the unlocking device. Other companies focused on biometrics including hand grip (NJIT) or finger print recognition and another company focused on the gun having its own mechanical lock (a retrofit to a regularly sold gun). Lisa Reisboard and I went to the event with NJ Together, part of the Metro Industrial Areas Foundation. 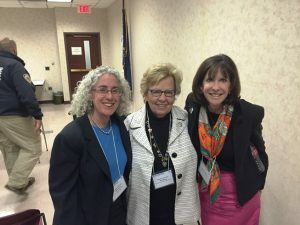 NJ Together has been focused on the issue of gun safety for the past two years. My friend Rabbi Joel Mosbacher is a leader of this local and national issue, personally touched by the tragedy of his own father’s murder by gun violence 15 years ago. It was great to see NJ State Senator Loretta Weinberg at the event. I sat with her and publicly thanked her during the opening session. Loretta is the leader in NJ legislation for childproof handguns which had terrific intentions over a decade ago but now needs to be replaced to enable the smart gun industry to emerge. The current legislation indicates that as soon as a smart gun is sold anywhere in the country, within three years, all handguns in NJ must be smart guns. This is stifling a potential emerging smart gun market. Margot Hirsch, of the Smart Gun Foundation, spoke about the 1 million dollar challenge which began two years ago. A few developers were selected to receive funds to address this issue. “What Tesla and uber have done, we hope someone can do for the gun industry.” And there is not just one solution because there are different needs to there needs to be a variety of technologies. The Smart Tech Gun Fair was an opportunity for police and individuals to see how the technology works. Clergy, police chiefs, mayors, and lay leaders were present from 5 states: NY, NJ, CT, MA and OH. The 5 developers presented their technology. 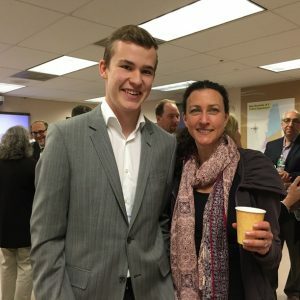 It was amazing to meet Kai Kloepfer, 18 year old Colorado high school student (he graduated a few days ago and is deferring his studies at MIT to pursue smart gun technology with his company AeGen Technology). Kai is from Boulder, about half an hour from where the Aurora movie massacre occurred and for his high school science research addressed an area of deep concern. He explained that focusing on individual’s using guns (through fingerprint recognition) there is a good opportunity to avoid accidental deaths through unauthorized use. Another company was founded by two law enforcement officers in response to a friend’s request to have a safe gun around his child. They realized one did not yet exist and built a prototype with a built in lock. Their lock is for Assault rifles and Glock/other handguns. I asked them who needs Assault Rifles and they said anyone. I learned from them that today, 60% to 40% individuals by Assault rifles vs. handguns for self protection. Smart guns are one part of Metro IAF’s Do Not Stand Idly By Campaign against gun violence. As taxpayers, we purchase 40 % of the guns for the military and police. Over 70 municipalities, states and counties across the nation have signed on to an RFI (Request for Information) indicating the next time they purchase guns, they will inquire about gun distribution and possible smart gun technology. Lisa and I spoke to the Livingston Town Council along with Bob Singer and members of the Livingston Clergy Association in Spring 2014 and are proud the Council signed on to the RFI. Every 30 minutes another child dies or is injured by a firearm. We owe it to the present and the future not to stand idly by.